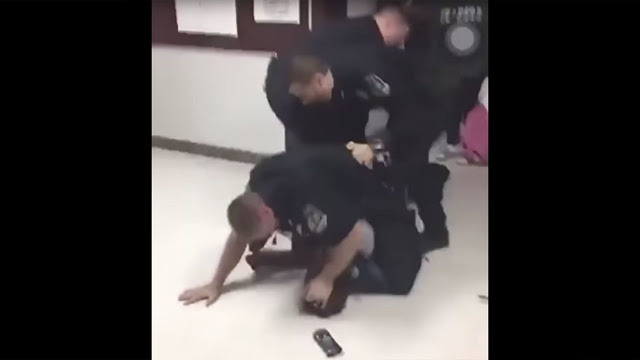 A Kentucky high school student reportedly attacked a police officer on Wednesday afternoon during an altercation at a Jefferstontown County public school, and it was all caught on video — including an officer using a Taser on the student. A student resource officer at Jeffersontown High School intervened after two students began tussling over a set of headphones in the cafeteria. As the officer tried to remove one of the students from the building, in an attempt to stop the fight, the student’s brother and others reportedly attempted to attack him. As a result of the attempted attack, the officer had to call for backup. According to Jeffersontown Police Chief Kenneth Hatmaker, the brother of the original suspect “sucker-punched” one of the other officers who arrived on the scene in the head and then tackled him into a wall. According to the report, the original suspect’s brother and other students “escalated a fight” with the other officers. After the officer was hit, another cop kneed one of the students in what Hatmaker called a “knee strike,” which he later said was “appropriate” force. One of the cops also reportedly had to use a stun gun to subdue the student, who was on the ground at the time. Hatmaker said both the student and his brother were arrested on assault and disorderly conduct charges, according to the Courier-Journal. Hatmaker revealed that two versions of the video exist — one that he said is edited and shows only the officer response to the attack, and one that reportedly shows the entire altercation. He said that he saw both versions. “I saw my officer attacked, hit in the head,” Hatmaker said. According to the Courier-Journal, Hatmaker said he felt the officer’s response was reasonable. “I think our response was very appropriate,” he said. What happened to the suspects as a result of the fight? According to WDRB-TV, the student who reportedly attacked the officer intervened because he was trying to protect his brother from being the victim of excessive police force. She admitted to WDRB that her boys do have a history of getting into fights. She is now considering legal action against the school and the officer.